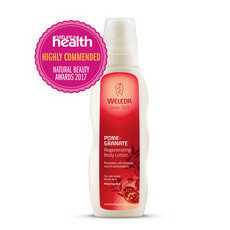 Indulge your sense with this Wild Rose Pampering Body Lotion from Weleda. Allow the sweet scent of Damascene Rose soothe your soul, while the hard-working lotion smooths your skin. In addition to Wild Rose extracts, the beautiful body lotion also includes Jojoba Oil, Shea Butter and Witch Hazel to help stimulate the body's natural regenerative process and improve skin elasticity. Made in Switzerland, NATRUE Certified Organic, GMO & Cruelty Free, Vegan, Certified Fair Trade. Jojoba Oil, Rose, Shea Butter, Witch Hazel. Shake the bottle upside down before first use. Spray a little product into your hand and then use long sweeping movements in the direction of your heart to disperse over your body. Nice light lotion, prefer the citrus or the red one.